Antigua and Barbuda’s Minister of Tourism, Economic Development, Investment and Energy, The Hon. Asot A. Michael, has said that airlift into Antigua and Barbuda from its critical North East corridor of the USA will be augmented by the arrival of JetBlue Airways for the upcoming winter season. The arrival of JetBlue, he announced, will open up the destination to even more business, increase the competitiveness of the destination within the US travel market and encourage more air travel. The Tourism Minister made the remarks, at a press conference held last week Friday at the V.C Bird International Airport, attended by Antigua and Barbuda Government Officials, Senior Executives of JetBlue Airways, Antigua and Barbuda Airline Executives and Antigua and Barbuda Tourism Officials. JetBlue Airways, will begin direct service to Antigua from its base in New York’s JFK International Airport on November 5. The airline is known for its attractive fares, and value service which has created a strong brand loyalty among a younger demographic in the US. The JetBlue Airbus A320, which carries 150 seats will be available to travellers to Antigua on, Tuesdays, Thursdays and Sundays. The Tri-state area of New York, New Jersey and Connecticut is the largest metropolitan area of the US and is home to some 23.6 Million people who comprise a key demographic amongst the US source market. 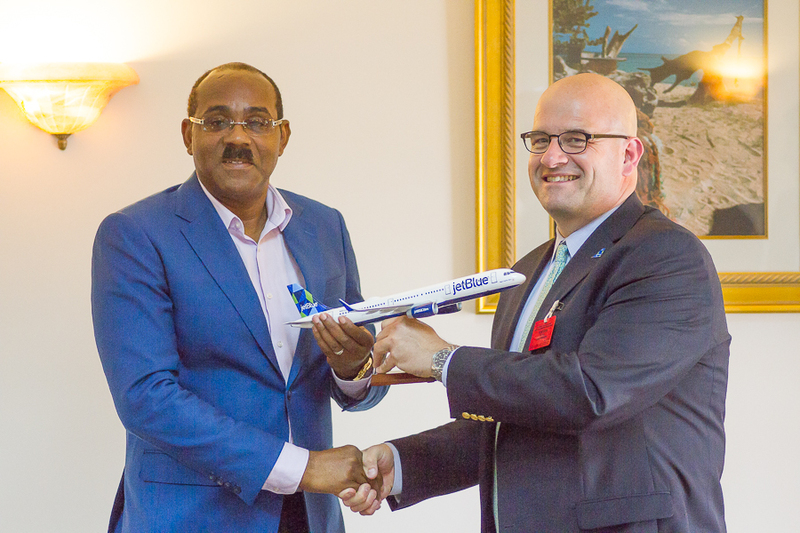 “We offer customers more options than any other airline to the Caribbean, and the beautiful destination of Antigua will be a great addition to our network for those wanting to discover something new. A gorgeous Caribbean island, Antigua offers beaches, history and romance, along with world-class resorts like Sandals.” said Marty St. George, executive vice president, commercial and planning, JetBlue. The news of the new JetBlue flight was received with much enthusiasm by hoteliers on island who look forward to the impact that the increased seats will have on occupancy and revenues.